There are lots of places to buy cards online here in 2019. Several places have a great selection, eBay and Sportlots to name a couple. 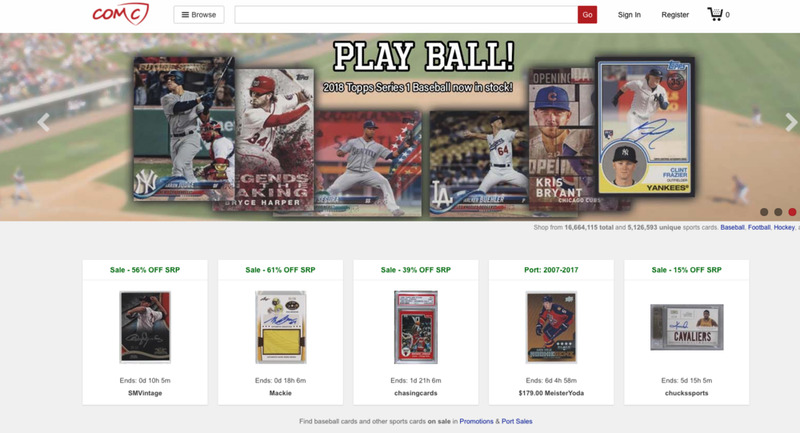 But if you are looking for a place to search an inventory of millions of cards, see front and back scans of each one, and be able to combine purchases from multiple sellers into one low cost shipment, then COMC is a site you need to check out. COMC is a consignment seller, meaning people send in the cards they want to sell, COMC catalogs and stores them, and the seller sets their own prices and pays COMC a listing fee, a small transaction fee, and then a “cash out” fee. 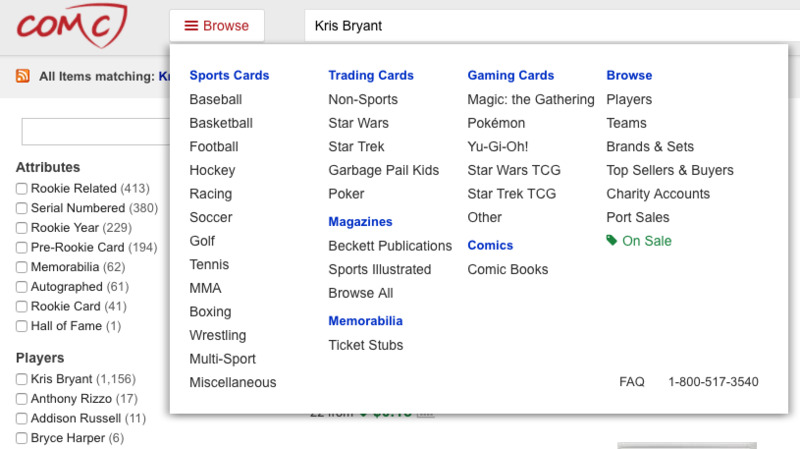 As a buyer, you just get to search the site for the cards you are looking for and buy away! There are options available to purchase the cards immediately, but many sellers allow you to make an offer if the card seems priced a bit more than you are willing to pay. You can even add multiple cards from a seller to your cart and make an offer on the whole lot. Anytime you have a situation where people are naming their prices there will be cards way over priced and way under priced. The lowest you’ll find is .26, but most base commons will be found for around .30-.40 a piece. That may sound a bit steep, but you have to remember that the combined single shipment will end up saving you a ton in the long run, especially if you are buying 30,40, or more cards. 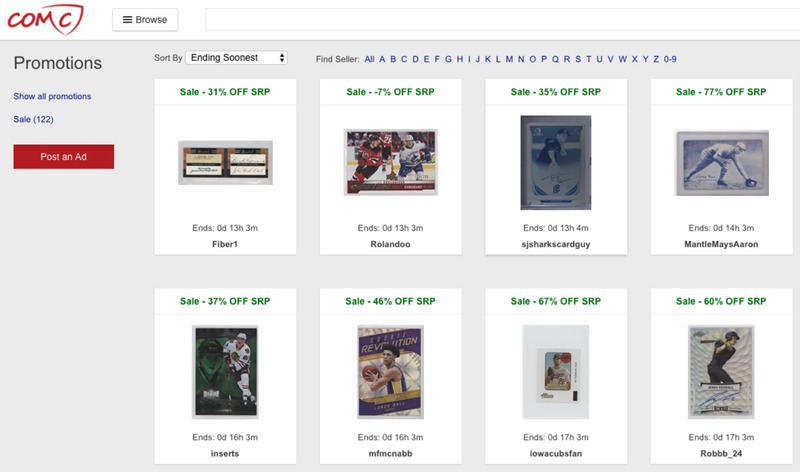 Sellers also have an option to sell an entire collection at once, or even put their whole portfolio on sale. I’ll often browse the “Sale” page to see if there are any deals to be had, and I’ve added several bargains to my PC through this option. I’ve not yet purchased a portfolio because the ones I’ve seen so far seemed to be a bit overpriced. It seems like the real bargain portfolios get snapped up pretty quick. One of the things I love about the site is that once you purchase a card, you automatically have the option to either ship it or list it! When I first discovered COMC I purchased $10 in store credit to try it out. Well over the next year I started flipping cards that were great deals, and I was able to build up around $100 in store credit and also have a couple hundred cards shipped to me! I got some entertainment out of the process, and the fact I was able to end up with a bunch of free cards made me appreciate them even more. My biggest success story was finding a card for .30 and selling it for almost $20. Yes, those kind of deals can be found from time to time! Last year, the purchase of collections like this one was creating an inventory too large to sell on eBay. The listing limits on my account would have required an upgraded store cost, and even if I was willing to pay more for my store, the time required to get the 1-2K cards listed would have been enormous. So I decided to try submitting them to COMC! You send in a box of cards, and then for .30 per card they scan the front and back, categorize, and list it on the site. Once you price it, it is available for sale. You can even opt in to make your portfolio available to list on eBay and Amazon for an additional commission. When the card sells, they take care of shipping it to the customer! There is a sales commission of 5% on each transaction, and then when you cash out COMC takes another 10%. Some people complain about the .30 per card, the Amazon/Ebay fees, and 10% cashout fee, but at the end of the day it isn’t that much more than the 10-15% combined eBay and PayPal fee. All you had to do is send it in and price it. The little bit extra seems like a small price to pay for not having to scan, list, and ship thousands of cards. I had about reached the point with my Sportlots and eBay listings where I couldn’t scale anymore due to time constraints. COMC has become the solution to my problem and allowed me to continue to pursue collections and quickly get them up for sale. In addition, now that I have regular sales on the site, I am able to use my store credit to cover the cost of processing the additional cards I submit and therefore don’t have to add any more funds to my account. It is essentially self sustaining at this point! I highly recommend COMC as both a buyer and seller. Whether you are looking to buy high end singles or complete sets, the site most likely has what you need. Have cards to sell, but don’t have the time to list them yourself? COMC is a great solution to that problem as well. Have you used COMC? Let me know what you think in the comments below! Please take a second to subscribe to the blog and as always, sharing with your friends is appreciated!